The ocean is a magical place where many amazing animals live their lives, deep down under the sea. Much like on land, the deep sea animal kingdom can be a pretty dramatic place. If you want an Oceanic twist for your little one this Halloween, picking the right ocean creature for your innocent infant can be tricky. A shark can seem a little harsh, your infant isn't very vicious. Of course, you don't want those other babies to see your child as helpless in a clown fish costume either. Your baby needs to be taken seriously. Congratulations, you've found the perfect way to strike a balance! The orca is one of the ocean's most tenacious yet adorable predators. When you wrap your infant in the faux fur and satin of this whale bunting, you're not just wrapping your child in a super cute costume, no. You are wrapping your beloved child in the concept of this noble creature and all that it entails. This includes the orca's ability to think on it's feet, to see opportunity where other whales may not, the ability learn quickly, and to communicate with their pod. Orcas can live in the cold water of the Arctic and in the beautiful tropics. Talk about an adaptable creature! 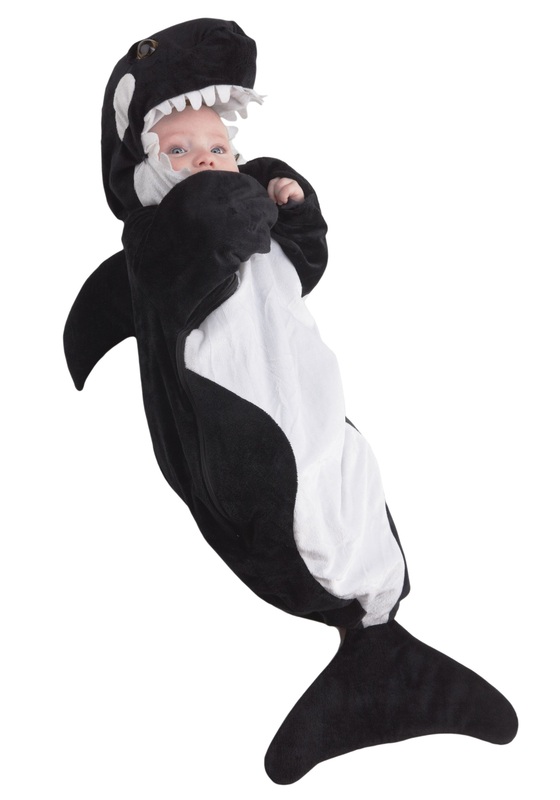 Sure, your child doesn't even know what a whale is yet, but you never know what costume qualities might seep into a baby's subconscious. On Halloween night, as you're making your rounds or handing out candy, your baby will stay cozy. If you're lucky your little orca might even drift off to sleep and dream of deep sea adventures with a posse of ocean friends. The convenient off center zipper makes it very easy to Free Willy at the end of the night. We're confident that baby's first Halloween costume will make a splash, so batten down the hatches and get ready for a good time.